It is not enough to finish a project on time and within budget…you must also realise the benefits! Benefit Realisation is about tracking the business outcomes and benefits to ensure your projects do achieve their planned goals in the years after completion. For example say you run a project to deploy a project management system but don’t track its success. One year later only 30% of the system maybe being used, change management has not quite worked and performance is poor and frustrating. For just the cost of some training and customised reports you could increase the benefits realised from using the system from maybe 50% to 90%. The eTrack Benefit Realisation module allows you to define and track benefits during and after a project and maintain visibility and accountability of the business outcomes. It can be used either as a stand-alone system or fully integrated with the rest of eTrack and customised to any methodology. For a paper describing software support for Benefit Realisation please click here. Capture Strategic Objectives and New Ideas. 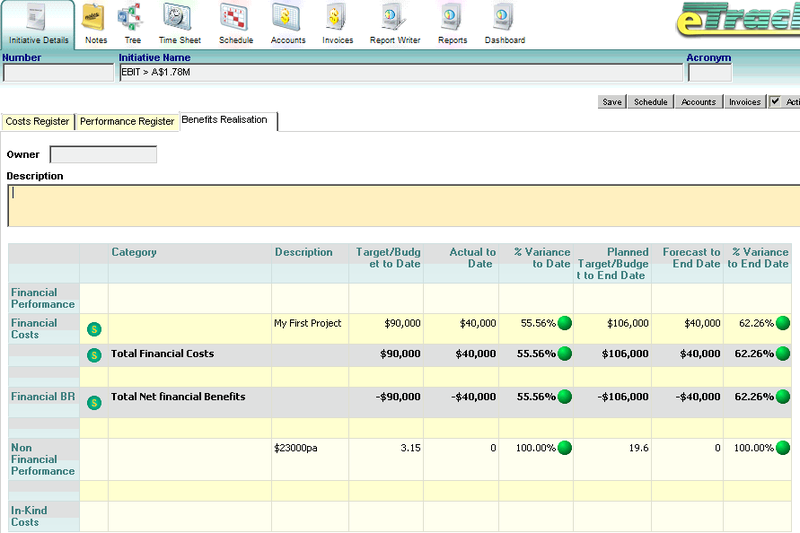 Manage business justification of projects. 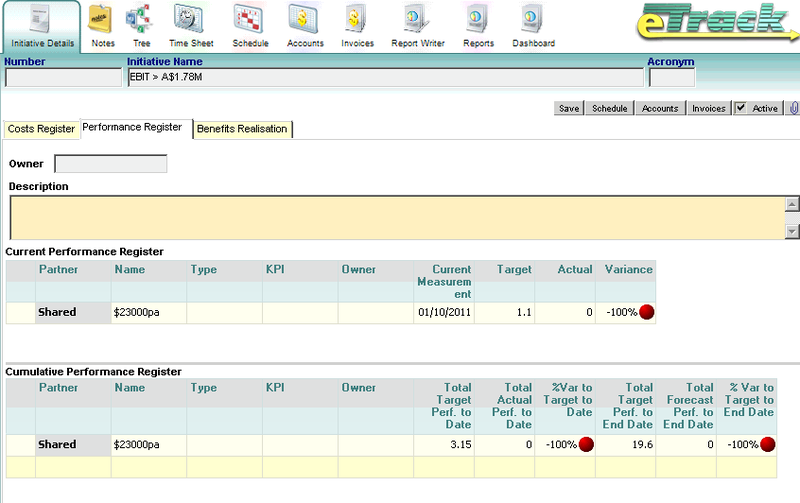 Create a Benefit Register and plan each Outcome ROI. Prioritise Projects and model ‘Result Chains’ [DMR]. Plan and track the whole Development Lifecycle . 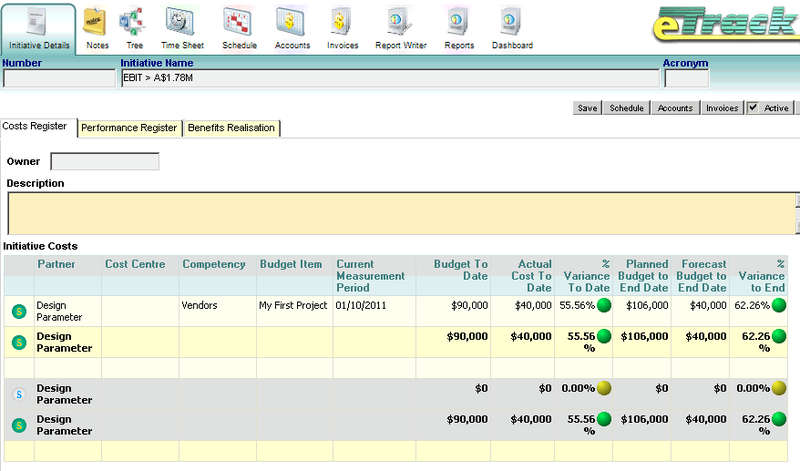 Compare project Costs with benefit ROIs. 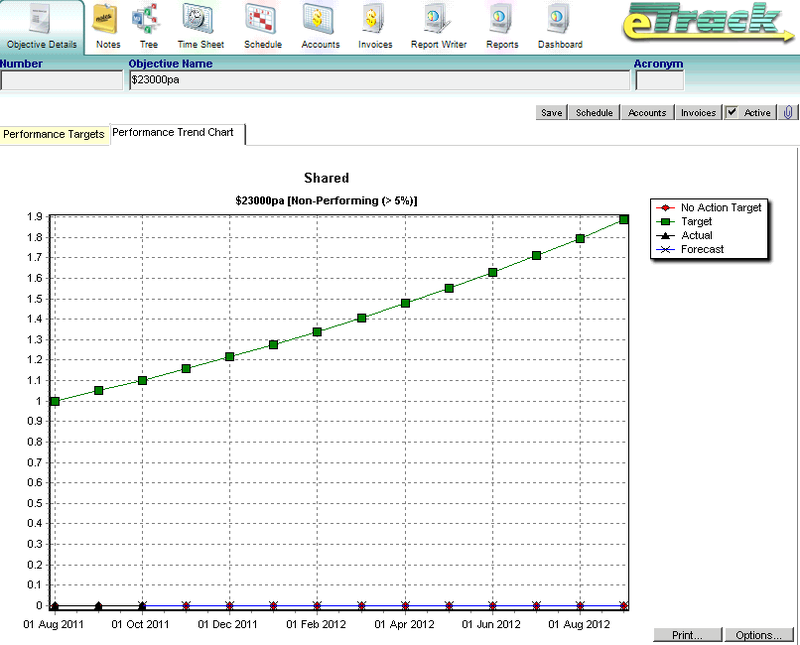 Maintain an Audit Trail for Capitalising Projects. A project starts and ends and by definition it is not ongoing. A team will often come together and be given a specific task and when complete move onto the next project before outcomes are benefits are realised. No one is responsible for tracking the outcomes or has the authority or budget to spend that little bit extra to realise the benefits. Have you ever celebrated the completion of a project only later to realise that its outcome is no longer needed …or it depends on a cancelled or delayed project…or the project has been done twice…or the budget has run out on a series of projects before an actual business benefit is realised…or no one is accountable for achieving the business benefits? Has the business strategic reason for doing the project been communicated to Project Managers and Business Analysts so they can assess priorities when time and budget get tight and changes to requirements occur? Has a project continued even though the original benefits are no longer needed? Have you wanted to capitalise an IT project to reduce expenses and increase assets but not been able to ascertain the benefits? Have you been audited and not been able to easily prove why you capitalised an ‘enabling’ project? Due to eTrack’s innovative architecture, its Benefit Realisation capabilities use the same user interface seamlessly combined with project and management and support tracking. Users can do enterprise wide scheduling, budgeting and resource management at the same time as comparing investment costs with benefit returns all in the same module. Define the strategic goals of your company, the initiatives and Objectives and relate these rto projects in a multi-dimensional view. 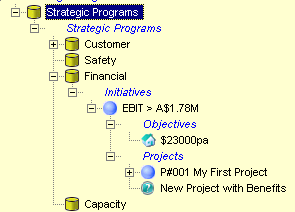 The business structure and terminology shown in the picture can be changed to match your methodology. For each project, enter the estimated costs per month during the project cycle and also the ongoing costs to ensure benefits are realized and maintained after the project has finished (see introduction above). 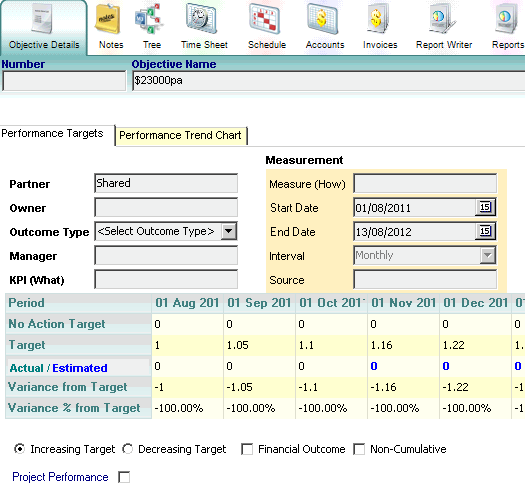 Estimate the benefits of the outcome of the project: the Performance Targets. These may be: Increasing (eg. number of members), or Decreasing (eg. trains late than more than 5 minutes), and separately defined asFinancial (eg. revenue from customers) or Non-Financial (eg new outbreaks or Malaria) or ‘In-Kind’ or ‘Monitorsed’ used if benefit is not directly financial but a financial impact can be calculated (eg staff turnover). 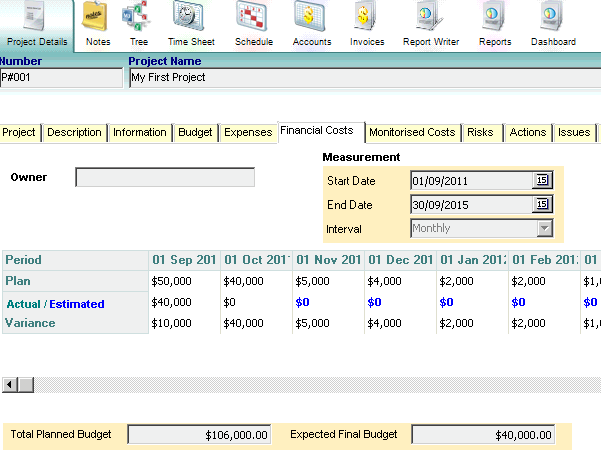 After defining the costs and benefit of each project or program of work, all costs can now be viewed rolled up across your company with Budget, Actual and Variation calculations shown in a ‘traffic light’ display. A full overview of all Benefits can be viewed both current and accumulative. And finally a dashboard of all costs compared with all benefits of all projects and objectives, rollup in real time across your whole company. The above views can be extrapolated to the Strategic Program level to allow you to realize the benefits of your whole company against your strategic goals.